Angels & Demons is a 2009 American mystery thriller film directed by Ron Howard and written by Akiva Goldsman and David Koepp, based on Dan Brown's novel of the same name. It is the sequel to the 2006 film The Da Vinci Code, also directed by Howard, and the second installment in the Robert Langdon film series. The novel was published first and The Da Vinci Code novel followed it. Filming took place in Rome, Italy, and the Sony Pictures Studios in Culver City, California. Tom Hanks reprises his role as Professor Robert Langdon. Producer Brian Grazer, composer Hans Zimmer and screenwriter Akiva Goldsman also return, with David Koepp coming on board to help the latter. As of 2015, the film and its sequel, Inferno, remain Hanks' only live-action sequels. Under the watchful eyes of Father Silvano Bentivoglio (Carmen Argenziano) and Dr. Vittoria Vetra (Ayelet Zurer), the European Organization for Nuclear Research (CERN) initiates the Large Hadron Collider and creates three vials of antimatter particles larger than any ever been produced before. Almost immediately, Father Silvano is killed and one of the vials of antimatter goes missing. At the same time, the Roman Catholic Church is mourning the sudden death of Pope Pius XVI in Rome and prepares for the papal conclave to elect the next Pope. The Camerlengo, Father Patrick McKenna (Ewan McGregor), assumes temporary control of the Vatican. Before the conclave enters seclusion, four of the "preferiti" (the favorite cardinals to be elected pope) are kidnapped by a man claiming to represent the Illuminati. In a video message, he threatens to kill one candidate every hour starting at 8pm and to destroy all of Vatican City at midnight, using the missing vial of antimatter as a bomb. The Vatican summons symbologist Robert Langdon (Tom Hanks) from Harvard University and Vetra to help them save the four preferiti and locate the vial. Langdon listens to the Illuminati's message and deduces the four cardinals will die at the four altars of the "Path of Illumination", marked by statues of angels in locations relevant to the four classical elements. Over the objections of Commander Maximilian Richter, head of the Swiss Guard, but with McKenna's consent, Langdon is granted access to the Vatican Secret Archives. He examines Galileo Galilei's banned book with Vetra. Following the clues and accompanied by Inspector General Ernesto Olivetti and Claudio Vincenzi of the Vatican Gendarmerie Corps, they arrive at the Chigi Chapel in the Church of Santa Maria del Popolo. There they find Cardinal Ebner dead, suffocated with soil and branded with an ambigrammatic word "Earth". They verify the second location is the crowded Saint Peter's Square and arrive just as a bloody Cardinal Lamassé emerges with his chest branded with "Air". Vetra unsuccessfully attempts to perform CPR on him, only to discover his lungs had been punctured, while the assassin slips through the crowd. While Vetra studies Silvano's diaries, Langdon, Olivetti and Vincenzi locate the third church, Santa Maria della Vittoria, and arrive to see Cardinal Guidera, branded "Fire" and suspended above a burning pile of wood. A gunfight erupts between the assassin and the officers, with Olivetti and Vincenzi being killed in the process. Langdon manages to escape, but not before being spotted by the assassin. Langdon convinces two Carabinieri officers to take him to the next location and the trio race to the Water altar, the Fountain of the Four Rivers, just as the assassin arrives in a van. The assassin murders the officers and drops a bound and weighted Cardinal Baggia into the fountain before bidding farewell to Langdon and driving off. With the help of bystanders, Langdon rescues the cardinal, who tells him the Illuminati's lair is Castel Sant'Angelo. There, Langdon and Vetra discover a hidden passageway leading to the Vatican, being used as a hideout for the assassin. Discovering a case with marks for five branding irons, they realize the fifth brand is for the Camerlengo but are confronted by the assassin before they can alert McKenna. The assassin spares their lives once more, stating killing them is not a part of his mission unless they pursue him. He then cryptically warns them to be careful as his contractors are "men of God" before departing. He escapes to a car left for him by his contractor, but is killed immediately when it explodes upon ignition. Langdon and Vetra rush back to the Vatican where they find Commander Richter hovering over McKenna with a gun, the Vatican symbol branded into McKenna's chest. Richter and Archbishop Simeon are shot by the Guards. As Richter dies before Langdon, he opens his hand to reveal a key which Langdon takes. The stolen antimatter vial is found in St. Peter's Tomb below the church, but the battery life is too low to risk re-connecting it to a battery. McKenna, a former military pilot, seizes the vial and uses an awaiting helicopter to fly above the Vatican. At a high altitude, he parachutes out as the antimatter bomb explodes overhead. McKenna is hailed a hero and savior, and the cardinals move to elect him pope. Langdon and Vetra use Richter's key to watch a security video showing McKenna speaking to Richter before the attack. The video reveals it is McKenna, not the Illuminati, who masterminded the scheme. McKenna reveals he murdered the previous pope because he felt the pope had betrayed the church by trying to bridge the gap between science and religion. Once McKenna had killed the pope, he intended to have himself elected to the papacy whilst rallying the most conservative Cardinals to his side. The recording is shown to the Papal conclave, and it dawns on McKenna that he has been exposed. He flees to a remote recess in the building where he is able to commit suicide by setting himself on fire. The Vatican officially announces McKenna died due to internal injuries suffered during his parachute landing, and Cardinal Baggia is named Pope Luke, with Cardinal Strauss as the new Camerlengo. Strauss thanks Langdon for his assistance and gives Langdon Galileo's "Diagramma Veritatis" for his research as a gift from himself and Pope Luke, requesting only it be returned to the Vatican once he is finished, and any future references he may make about the Catholic Church in his future publications be done gently, to which Langdon replies, "I'll try." As the film ends, the new Pope Luke shares a grateful nod with Langdon and Vetra, and walks out onto the balcony to greet the crowd waiting for him in the Square. Tom Hanks as Robert Langdon, a Harvard University professor of symbology. Ewan McGregor as Father Patrick McKenna, the Camerlengo. Ayelet Zurer as Dr. Vittoria Vetra, a CERN scientist whose antimatter experiment has been stolen by the Illuminati. Stellan Skarsgård as Commander Maximilian Richter, head of the Swiss Guard. Pierfrancesco Favino as Inspector General Ernesto Olivetti of the Gendarme Corps of Vatican City State. Armin Mueller-Stahl as Cardinal Strauss, Dean of the College of Cardinals and the Papal Conclave. Thure Lindhardt as Lieutenant Chartrand, officer of the Swiss Guard. David Pasquesi as Claudio Vincenzi, a Vatican police officer sent to summon Langdon. Cosimo Fusco as Archbishop Simeon, Prefect of the Papal Household. Victor Alfieri as Lieutenant Valenti, a Carabinieri officer who takes Langdon to the Fountain of the Four Rivers. Carmen Argenziano as Father Silvano Bentivoglio, a Catholic priest and a CERN scientist who performed the antimatter experiment along with Dr. Vetra. Marco Fiorini as Cardinal Baggia/Pope Luke I, one of the four Preferiti and a cardinal from Milan, Italy and the favorite to succeed as the new pope. Bob Yerkes as Cardinal Guidera, one of the four Preferiti and a cardinal from Barcelona, Spain. Franklin Amobi as Cardinal Lamassé, one of the four Preferiti and a cardinal from Paris, France. Curt Lowens as Cardinal Ebner, one of the four Preferiti and a cardinal from Frankfurt, Germany. Todd Schneider as a Carabiniere, Lieutenant Valenti's partner who along with him takes Langdon to the Fountain of the Four Rivers. Anna Katarina as Docent, the Pantheon tour guide who tells Langdon the name of the first church. In 2003, Sony acquired the film rights to Angels & Demons along with The Da Vinci Code in a deal with author Dan Brown. In May 2006, following the release of the 2006 film adaptation of The Da Vinci Code, Sony hired screenwriter Akiva Goldsman, who wrote the film adaptation of The Da Vinci Code, to adapt Angels & Demons. Filming was originally to begin in February 2008 for a December 2008 release, but because of the 2007–2008 Writers Guild of America strike, production was pushed back for a May 15, 2009 release. David Koepp rewrote the script before shooting began. Director Ron Howard chose to treat Angels & Demons as a sequel to the previous film, rather than a prequel, since many had read the novel after The Da Vinci Code. He liked the idea that Langdon had been through one adventure and become a more confident character. Howard was also more comfortable taking liberties in adapting the story because the novel is less popular than The Da Vinci Code. Producer Brian Grazer said they were too "reverential" when adapting The Da Vinci Code, which resulted in it being "a little long and stagey." This time, "Langdon doesn't stop and give a speech. When he speaks, he's in motion." Howard concurred "it's very much about modernity clashing with antiquity and technology vs. faith, so these themes, these ideas are much more active whereas the other one lived so much in the past. The tones are just innately so different between the two stories." In the novel, the papal conclave attracts relatively little public attention. In the wake of the huge international interest in the 2005 election of Pope Benedict XVI, this was judged to be out of date. There are many differences between the novel and the film. The character of CERN Director Maximillian Kohler does not appear in the film. The Italian Camerlengo Carlo Ventresca is changed to the Irish Patrick McKenna, portrayed by Ewan McGregor. The Boeing X-33 that takes Langdon from the United States to Geneva and then to Rome is absent in the film. In the novel, Commander Olivetti is the commander of Swiss Guard, and his second in command is Captain Rocher, whereas in the film, Richter is the head of the Swiss Guard. In the novel, the Assassin contacts members of the BBC in order to influence how they present the story of his activities, but this does not happen in the film. The character Leonardo Vetra is named Silvano Bentivoglio in the film, is not related to Vittoria and his death scene is changed. Vittoria is a love interest for Langdon in the novel while there is no attraction present in the film. In the novel Camerlengo Carlo Ventresca is revealed to be the late pope's biological son, in the film he is his adoptive son. In the book, the assassin has Middle Eastern looks whereas in the movie he is portrayed by a Danish actor. In the film, he is killed by a car bomb, whereas in the book he falls from a balcony at the top of the Castel Sant Angelo and breaks his back on a pile of marble cannonballs which eventually kills him. In the novel, Vittoria is kidnapped, whereas in the film, she follows Langdon almost everywhere. In the book, all four preferiti are killed by the assassin and eventually the high elector, Cardinal Saverio Mortati, is elected as the new pope whereas in the film, the fourth preferito, Cardinal Baggia, is saved by Langdon and is elected the new pope. The high elector, renamed Cardinal Strauss, becomes the Camerlengo to the new pope. In the end, the new Camerlengo hands over Galileo's book to Langdon instead of a Swiss guard handing the 5th brand, the Illuminati diamond (which is also different in the movie and looks like two crossed keys). In the movie before the explosion Langdon doesn't get on the helicopter unlike in the book where he does and right before the explosion jumps out, barely surviving. Shooting began on June 4, 2008 in Rome under the fake working title Obelisk. The filmmakers scheduled three weeks of exterior location filming because of a predicted 2008 Screen Actors Guild strike on June 30. The rest of the film would be shot at Sony Pictures Studios in Culver City, California, to allow for this halt. Roman Catholic Church officials found The Da Vinci Code offensive and forbade filming in their churches, so these scenes were shot at Sony. The Caserta Palace doubled for the inside of the Vatican, and the Biblioteca Angelica was used for the Vatican Library. Filming took place at the University of California, Los Angeles in July. Sony and Imagine Entertainment organized an eco-friendly shoot, selecting when to shoot locations based on how much time and fuel it would save, using cargo containers to support set walls or greenscreens, as well as storing props for future productions or donating them to charity. Howard hated that the Writers Guild strike forced him to delay shooting the film until summer. However, the quick shoot allowed him to refine the naturalism he had employed on his previous film Frost/Nixon, often using handheld cameras to lend an additional energy to the scenes. Hanks interrupted filming of one scene in order to help Australian bride Natalia Dearnley get through the crowds to her wedding on time. McGregor said the Pope's funeral was the dullest sequence to film, as they were just walking across staircases. Then, "Someone started singing 'Bohemian Rhapsody' [and] it became the funeral theme tune." When recreating the interior of St. Peter's Basilica, production designer Allan Cameron and visual effects supervisor Angus Bickerton recognized the 80 feet tall soundstages were only half the size of the real church. They rebuilt the area around and the crypts beneath St. Peter's baldachin, including the bottoms of the columns and Saint Peter's statue, and surrounded it with a 360 degree greenscreen so the rest could be built digitally. Cameron had twenty crew members, posing as members of the public, photograph as much as they could inside the Sistine Chapel, and had artists sketch, photograph and enlarge recreations of the paintings and mosaics from the photographs. Cameron chose to present the Sistine Chapel as it was before the restoration of its frescoes, because he preferred the contrast the smoky, muted colors would present with the cardinals. Although the chapel was built to full size, the Sala Regia was made smaller to fit inside the stage. The Saint Peter's Square and the Piazza Navona sets were built on the same backlot; after completion of scenes at the former, six weeks were spent converting the set, knocking down the Basilica side and excavating 3½ feet of tarmac to build the fountain. As there had been filming at the real Piazza Navona, the transition between it and the replica had to be seamless. To present the Santa Maria del Popolo undergoing renovation, a police station in Rome opposite the real church was used for the exterior; the scaffolding would hide that it was not the church. Cameron built the interior of Santa Maria del Popolo on the same set as the recreated Santa Maria della Vittoria to save money; the scaffolding also disguised this. The film's version of Santa Maria della Vittoria was larger than the real one, so it would accommodate the cranes used to film the scene. To film the Pantheon's interior, two aediculae and the tomb of Raphael were rebuilt to scale at a height of 30 feet, while the rest was greenscreen. Because of the building's symmetrical layout, the filmmakers were able to shoot the whole scene over two days and redress the real side to pretend it was another. The second unit took photographs of the Large Hadron Collider and pasted these in scenes set at CERN. Angels & Demons: Original Motion Picture Soundtrack was released on May 22, 2009. Hans Zimmer returned to compose the score for the sequel. He chose to develop the "Chevaliers de Sangreal" track from the end of The Da Vinci Code as Langdon's main theme in the film, featuring prominently in the tracks "God Particle " and "503". The soundtrack also features violinist Joshua Bell. The DVD was released on November 24, 2009 in several countries as a theatrical version and extended cut. The extended cut includes violent scenes which had been cut out to secure a PG-13 rating. In the UK, the already censored US theatrical version had to be censored further in order to obtain a BBFC 12A rating. The Blu-ray includes the original theatrical version and is classified BBFC 15. Overseas, Angels & Demons maintained the #1 position for the second weekend as well even with the release of Night at the Museum: Battle of the Smithsonian, which opened at #2. The film opened with $46 million at the domestic box office. The Da Vinci Code had opened domestically to $77.1 million, but the sequel's opening met Columbia's $40–50 million prediction, since the film's source material was not as popular as its predecessor's. Within more than a month, the film grossed $478,869,160 worldwide, making it the largest-grossing film of 2009 until it was surpassed by Transformers: Revenge of the Fallen. Of this $478 million, just over 27% of it is from domestic venues, giving the film high worldwide totals, with over $30 million in the UK, $21 million in Spain, $13 million in Brazil, $13 million in Russia, $34 million in Japan, and $47 million in Germany. Angels & Demons was the ninth-highest-grossing film of 2009, with box-office figures of $485,930,810 worldwide. The film received mixed reviews from critics. Review aggregation website Rotten Tomatoes reported that only 37% of 249 critics have given the film a positive review, with an average rating of 5.1/10. The site's general consensus is that "Angels and Demons is a fast-paced thrill ride, and an improvement on the last Dan Brown adaptation, but the storyline too often wavers between implausible and ridiculous, and does not translate effectively to the big screen." Metacritic has a rating score of 48 out of 100 based on 36 reviews. BBC critic Mark Kermode criticized the film's "silliness", saying "Whereas the original movie featured Hanks standing around in darkened rooms explaining the plot to anyone who was still awake, this second salvo cranks up the action by having Tom explain the plot while running - a major breakthrough." Richard Corliss of Time gave the film a positive review, stating that "Angels & Demons has elemental satisfactions in its blend of movie genre that could appeal to wide segments of the audience." Roger Ebert of the Chicago Sun-Times awarded the film three stars, praising Howard's direction as an "even-handed job of balancing the scales" and claiming "[the film] promises to entertain." The Christian Science Monitor gave the film a positive review, claiming the movie is "an OK action film." Peter Travers of Rolling Stone gave the film two-and-a-half out of four stars claiming "the movie can be enjoyed for the hell-raising hooey it is." Joe Morgenstern of The Wall Street Journal gave the film a mixed review, claiming it "manages to keep you partially engaged even at its most esoteric or absurd." Neil Smith from Total Film gave the film four out of five stars, saying "some of the author's crazier embellishments are jettisoned in a film that atones for The Da Vinci Code's cardinal sin — thou shalt not bore." Kim Newman awarded it three out of five stars, stating "every supporting character acts like an unhelpful idiot to keep the plot stirring, while yet again a seemingly all-powerful conspiracy seems to consist of two whole evil guys." CBS News interviewed a priest working in Santa Susanna, who stated the Church did not want their churches to be associated with scenes of murder. A tour guide also stated most priests do not object to tourists who visit out of interest after reading the book, a trend which will continue after people see the film. "I think they are aware that it's... a work of fiction and that it's bringing people into their churches." Grazer deemed it odd that although The Da Vinci Code was a more controversial novel, they had more freedom shooting its film adaptation in London and France. Italian authorities hoped the filmmakers corrected the location errors in the novel, to limit the amount of explaining they will have to do for confused tourists. William A. Donohue, president of the Catholic League, has not called for a boycott, but has requested that Catholics inform others about anti-Catholic sentiments in the story. "My goal... is to give the public a big FYI: Enjoy the movie, but know that it is a fable. It is based on malicious myths, intentionally advanced by Ron Howard." A Sony executive responded that they were disappointed Donohue had not created attention for the film closer to its release date. Howard criticized Donohue for prejudging the film, responding that it could not be called anti-Catholic since Langdon protects the Church, and because of its depiction of priests who support science. The official Vatican newspaper L'Osservatore Romano has called the film "harmless entertainment", giving it a positive review and acknowledging that "the theme is always the same: a sect versus the Church, [but] this time, the Church is on the side of the good guys." Beforehand, it had stated it would not approve the film, while La Stampa reported the Vatican would boycott it. However, it also quoted Archbishop Velasio De Paolis as saying a boycott would probably just have the "boomerang effect" of drawing more attention to Angels & Demons and making it more popular. In a FAQ titled Angels & Demons: from the Book to the Movie, Massimo Introvigne, Director of CESNUR (Center for the Study of New Religions) points out crucial factual errors in Dan Brown's original novel and the film version. Introvigne also criticizes the Illuminati mythology that is treated as historical fact. In Samoa, the film was banned by film censor Lei'ataua Olo'apu. Olo'apu stated that he was banning the film because it was "critical of the Catholic Church" and so as to "avoid any religious discrimination by other denominations and faiths against the Church." The Samoa Observer remarked that Olo'apu himself is Catholic. The Censorship Board had previously banned the film The Da Vinci Code, for being "contradictory to Christian beliefs." Sony Pictures produced a film adaptation of Inferno, the fourth book in the Robert Langdon series, which was released on October 14, 2016 with Ron Howard as director, David Koepp adapting the screenplay and Tom Hanks reprising his role as Robert Langdon. Filming began on April 27, 2015 in Venice, Italy, and wrapped up on July 21, 2015. On December 2, 2014, Felicity Jones was in early talks to star in the film. Bollywood actor Irrfan Khan has also been cast, as The Provost. Danish actress Sidse Babett Knudsen was also added to the cast as Elizabeth Sinskey. ↑ "ANGELS & DEMONS (12A)". British Board of Film Classification. April 17, 2009. Retrieved January 12, 2016. ↑ DiOrio, Carl (May 17, 2009). "'Angels & Demons' hauls $48 million". Nielsen Business Media, Inc. The Hollywood Reporter. Archived from the original on May 21, 2009. Retrieved January 11, 2010. ↑ "Angels & Demons (2009)". Box Office Mojo. Archived from the original on October 10, 2009. Retrieved October 28, 2009. ↑ Michael Fleming (May 23, 2006). "Brown's "Angels" flies to bigscreen". Variety. Retrieved December 20, 2006. ↑ Michael Fleming (October 24, 2007). "Howard moves fast with "Code" sequel". Variety. Retrieved October 31, 2007. ↑ Tatiana Siegel (November 16, 2007). ""Da Vinci" prequel hit by strike". Variety. Retrieved November 17, 2007. ↑ Tatiana Siegel (June 11, 2008). "Koepp hopes to keep "Town" rolling". Variety. Retrieved October 30, 2008. 1 2 Ian Freer (May 2009). "Critical Mass". Empire. pp. 69–73. 1 2 Edward Douglas (November 13, 2008). "Ron Howard on Arrested Development and Angels & Demons". ComingSoon.net. Retrieved November 13, 2008. 1 2 Scott Bowles (October 17, 2008). "First look: "Angels & Demons" will fly faster than "Da Vinci"". USA Today. Retrieved October 28, 2008. ↑ Hanks, Tom; interviewed by Charlie Rose (May 13, 2009). "A conversation about the film "Angels and Demons"". PBS television (transcript). Archived from the original on May 17, 2009. Retrieved June 12, 2009. ↑ "What's the Difference between Angels and Demons the Book and Angels and Demons the Movie". thatwasnotinthebook.com. Retrieved 18 Oct 2013. 1 2 3 4 Elisabetta Povoledo (June 24, 2008). "Dan Brown Tourists: Next Stop, Rome?". The New York Times. Retrieved August 26, 2008. ↑ Pamela McClintock, Michael Fleming (February 27, 2008). "Film greenlights in limbo". Variety. Retrieved February 28, 2008. ↑ "ET on the top secret "Angels & Demons" set!". Entertainment Tonight. September 9, 2008. Archived from the original on October 6, 2008. Retrieved September 13, 2008. ↑ "ANGELS AND DEMONS was Filming Today at UCLA in Los Angeles". Collider. July 10, 2008. Archived from the original on October 6, 2008. Retrieved September 13, 2008. ↑ "A Green Production". Official site. Archived from the original on February 16, 2009. Retrieved March 28, 2009. ↑ Hanks saves Aussie bride, Nine News. Published May 19, 2009. Retrieved September 13, 2010. 1 2 "On Location". Official website. Archived from the original on February 16, 2009. Retrieved March 25, 2009. ↑ Perkins, Ceri. "ATLAS gets the Hollywood treatment". ATLAS e-News. CERN. Retrieved 24 August 2015. ↑ Angels & Demons (Original Motion Picture Soundtrack). iTunes. Retrieved October 22, 2010. ↑ ""Angels & Demons" flies high at box office (Reuters)". Yahoo! Movies. May 17, 2009. Archived from the original on May 21, 2009. Retrieved May 17, 2009. ↑ Frank Segers (June 21, 2009). "New 'Transformers' bows No. 1 overseas". Hollywood Reporter. Archived from the original on June 25, 2009. Retrieved June 22, 2009. ↑ "2009 Worldwide Grosses". IMDb. Retrieved April 7, 2012. 1 2 "Angels & Demons (2009)". IGN Entertainment. Rotten Tomatoes. Retrieved May 3, 2012. ↑ "Angels & Demons (2009): Reviews". CNET Networks. Metacritic. Retrieved May 2, 2010. ↑ Kermode, Mark. "Angels & Demons". The Guardian. Retrieved 8 June 2014. ↑ Corliss, Richard (May 13, 2009). "Review: Holy Hanks! Fun and Games in Angels & Demons". TIME Magazine. Archived from the original on May 16, 2009. Retrieved May 16, 2009. ↑ "Angels and Demons :: rogerebert.com :: review". Chicago Sun-Times. May 16, 2009. Archived from the original on May 18, 2009. Retrieved May 14, 2009. ↑ "Review: "Angels and Demons" - the Christian Science Monitor". Christian Science Monitor. May 15, 2009. Archived from the original on May 17, 2009. Retrieved May 16, 2009. ↑ "Angels & Demons : Review : Rolling Stone". Rolling Stone. May 14, 2009. Archived from the original on May 16, 2009. Retrieved May 16, 2009. ↑ Morgenstern, Joe. "Plot's Knots Bedevil "Angels"". The Wall Street Journal. Archived from the original on April 30, 2009. Retrieved May 16, 2009. ↑ "Review". Total Film. Future Publishing. Archived from the original on May 9, 2009. Retrieved May 6, 2009. ↑ "Review". Empire. Retrieved May 6, 2009. ↑ "Fans Line Up For "Angels & Demons" Tours". CBS News. June 19, 2008. Retrieved June 19, 2008. ↑ Tatiana Siegel (March 6, 2009). "Catholic controversy doesn't bug Sony". Variety. Archived from the original on March 10, 2009. Retrieved March 18, 2009. ↑ Ron Howard (April 20, 2009). "Angels & Demons: It's A Thriller, Not A Crusade". The Huffington Post. Archived from the original on April 22, 2009. Retrieved April 21, 2009. ↑ "Demons "harmless", says Vatican". BBC News Online. May 7, 2009. Archived from the original on May 10, 2009. Retrieved May 7, 2009. ↑ Singh, Anita (May 7, 2009). 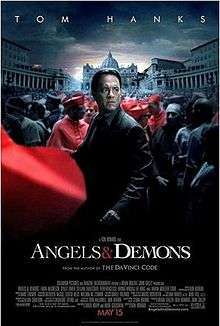 "Angels and Demons: Vatican breaks silence to review film". The Daily Telegraph. London. Archived from the original on May 9, 2009. Retrieved May 7, 2009. ↑ Eric J. Lyman (March 20, 2009). ""Angels & Demons" may face Vatican boycott". The Hollywood Reporter. Archived from the original on March 24, 2009. Retrieved March 23, 2009. ↑ "Chief censor bans movie Angels and Demons", Samoa Observer, May 21, 2009. ↑ "Samoa's government censor bans Da Vinci Code film". Radio New Zealand International. May 21, 2006. Retrieved September 19, 2011. ↑ "Samoa bans 'Milk' film" Archived February 19, 2012, at the Wayback Machine., ABC Radio Australia, April 30, 2009. ↑ Gregg Kilday. "Tom Hanks' 'Inferno' Shifts Opening to 2016". The Hollywood Reporter. ↑ "Tom Hanks And Ron Howard To Return For Next Dan Brown Movie 'Inferno'; Sony Sets December 2015 Release Date". Deadline.com. July 16, 2013. Retrieved July 16, 2013. ↑ "Sony Pictures Locks Tom Hanks, Ron Howard For April 'Inferno' Start". Deadline.com. August 26, 2014. Retrieved August 26, 2014. ↑ "Felicity Jones In Early Talks To Join 'Inferno' With Tom Hanks". Deadline.com. Dec 6, 2014. Retrieved Dec 2, 2014. ↑ Singh, Prashant (February 15, 2015). "Irrfan Khan to work with Tom Hanks in Inferno". Hindustan Times. New Delhi. Retrieved August 15, 2016. ↑ Patrick Hipes. "'Inferno' Movie Adds Omar Sy & More As Cast Goes Global - Deadline". Deadline. Retrieved 2016-04-23.